“Piecing together” rotary system components from different suppliers can potentially affect operation, leading to service disruptions and safety issues on the job site. James Stroud, Global Product Manager, Southco, Inc.
Rotary latch systems provide an effective and reliable means of remotely opening interior and exterior doors, compartments, hoods and engine covers, combining security and ergonomics with push-to-close convenience in off-highway equipment design. However, when designing rotary applications, many engineers choose to “piece together” components from different suppliers, often without thinking about whether the end result will operate cohesively as a system. Any compromise made in the selection of these components may ultimately affect operation, resulting in poor performance of the latch system, which can lead to service disruptions and safety issues on the job site. By selecting all rotary latch system elements from a proven supplier, OEMs can prevent the possibility of future equipment access issues. Typically, a rotary latch system combines three main elements: the rotary latch itself, the actuator (or operator interface), and the cable which connects these two components. What ultimately governs the effective and reliable operation, maintenance requirements and operator satisfaction of the whole system is the level of compatibility between these three elements. One of the most common everyday uses for a rotary system is to remotely open the engine hood of a large piece of off-highway equipment. In this application, a mechanical lever acts as the actuator and is activated from the driver’s seat, which is connected via a routed cable to the rotary latch within the engine compartment. By pulling the lever, the rotary latch is triggered, allowing the hood to open remotely for access. 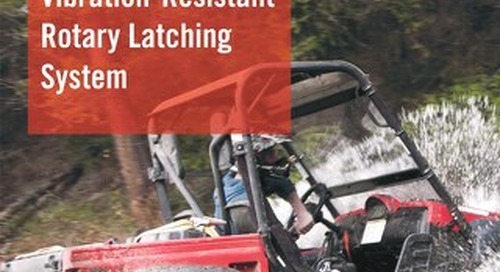 A complete rotary latch system consists of a rotary latch, an actuator and the cable that connects the two for remote latching in a variety of off-highway applications, such as entry doors and engine covers. System failure can occur when any or all of the components are sourced from different suppliers. For instance, when integrating the cable that connects the rotary latch with the actuator during the assembly process, the cable may not connect properly, resulting in poor fit and poor customer “feel”. This can directly influence the longevity of the system and lead to breakdown or component failure, because these components are simply not designed to work as a system. When the cable fittings don’t fit correctly, they may “pop out” later due to vibration and load from normal operation, or enable early release of the rotary latch, which ultimately impacts operator safety. Therefore, choosing components that make up a complete, complementary remote latching system plays a key role in enhancing the overall quality and success of a latching solution, as well as the operator experience. When specifying a rotary system, choosing the appropriate rotary latch is crucial, because it acts as the heart of the system. The primary deciding factor in any application should be based on the size or strength of the latch required. 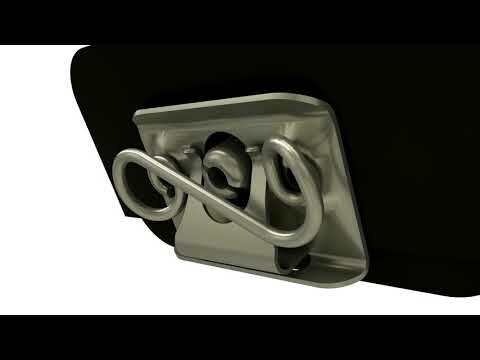 For example, a stronger latch may be required to open doors on a large piece of off-highway equipment, whereas a light-duty, compact latch would be better suited for opening hidden storage compartments within the vehicle cab. Another important design consideration is choosing between single or two-stage latching. Two-stage latching for instance, is recommended if greater insurance against the possibility of ‘false’ latching is required, and prevents the possibility of a door accidentally opening or not completely closing. The best example of this feature is a cab entry door; if not completely shut, it stays latched, but a secondary effort is still required to shut the door completely. 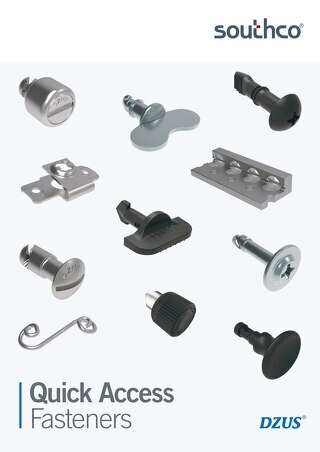 There are a variety of latch options available that offer differing performance attributes and mounting options to meet the unique needs of the application. The choice will depend on whether the latch will be used on a rigid or a flexible panel. Beyond that, some systems offer multiple triggering options, allowing the rotary latch to be easily configurable without having to change the overall design of the application. 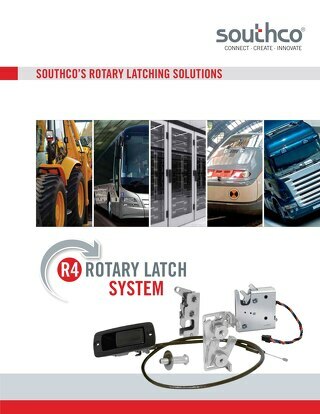 Rotary latches with multiple triggering options, like Southco’s R4-10 Dual Trigger series, provide multiple points of actuation, allowing the latch to be triggered by two independent actuators located on different areas of an application, while the integrated rubber bumper eliminates noise and vibration caused during equipment operation. Material selection also plays a key role when choosing a rotary solution for off-highway use. Rotary latches should be constructed of corrosion resistant materials such as stainless steel and 316 stainless steel to ensure that they withstand exposure to harsh operating environments, and maintain reliable operation when exposed to moisture and dust. Another important feature to consider when choosing a rotary latch is whether a single or double rotor is required. 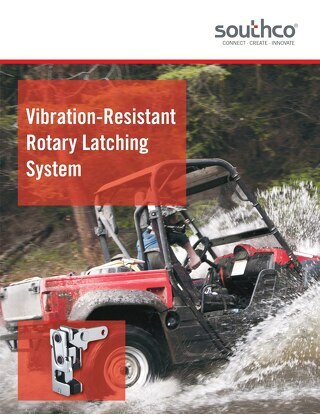 A majority of rotary latches are single rotor, with only one rotor engaging the striker. Double rotor latches however, tolerate misalignment and offer even greater strength than their single rotor counterparts, allowing them to withstand higher working loads. 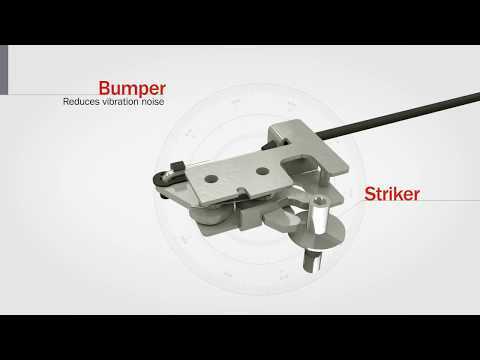 Additionally, rotary solutions are available with an integrated bumper that eliminates noise and vibration caused by normal operation by trapping the striker between a rubber bumper and rotor. This feature is especially useful in high vibration applications where noise pollution is a concern, because the bumper significantly dampens sound. As the only visible part of the mechanism, actuators serve as a “touch point” or interface between the operator and the latching mechanism itself. While functionality is important, the overall “feel” of the actuator can enhance the operator experience and create an increased perception of quality with regard to overall equipment design. Depending on the needs of the application, the actuator can also provide enhanced strength and security, as well as improved styling. Selecting the appropriate actuator generally depends on whether the actuation will take place on the interior or exterior of the application. Interior actuation – For interior applications, finger pull/paddle actuators or push button actuators are most commonly used as they provide a flush surface. Economical solutions such as a simple T-handle actuator may also be chosen, which offer an equal level of direct force, well suited to gloved hands. With regard to material choice, a broad variety of options including plastic, zinc die cast and aluminium cast are available. Plastic is a more economical choice, but zinc or aluminium may be preferred over plastics due to strength considerations and the perceived quality of a metal product. Exterior actuation – For exterior actuation, additional specification considerations come into play such as the desired level of security, the need for a larger design to accommodate gloved hand actuation, and available corrosion-resistant materials. The choice of product remains broad though, ranging from flush, surface mount and push handles to push buttons. The ability to include multiple key code options is almost universally available across the range of actuators. 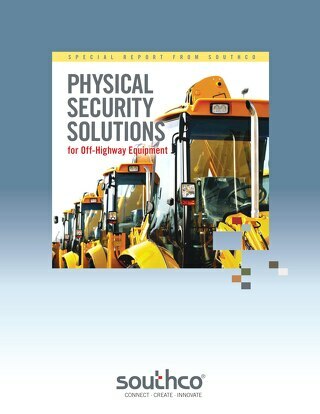 For enhanced access security in applications that are highly prone to theft or vandalism, such as construction equipment left overnight on a job site, an electromechanical access solution, like a key fob connected to an internal electronic actuator may be specified. These electronic mechanisms further improve access control by adding an additional layer of both security and flexibility to off-highway equipment by concealing the entire system, including the actuation point within the application. 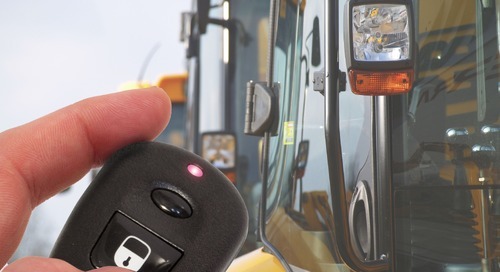 As a result, the operator can gain access via key fob, but the equipment exterior is free of pry points. 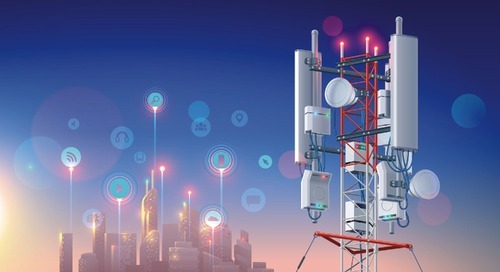 Additionally, electromechanical solutions provide the ability to control and monitor user credentials remotely, by generating a digital record of access which can be used for tracking access attempts over time. Once the rotary latch and actuator have been chosen, the operational effectiveness of these components will only be as successful as the cable selected to connect them. Issues can occur in situations where the design engineer specifies individual actuators and latches and then pieces them together without considering whether they will actually work together. To ensure the success of the application, designing a rotary latching system with the assistance of a supplier offering all three elements is vital. The role of the cable is to effectively transfer the mechanical input from the operator via the actuator to the rotary latch to enable it to open as quickly and safely as possible. Engineers generally face a choice between bare and coated cables – generally used in applications where the cables can be seen. A third type of cable used for remote actuation are jacketed cables, which offer the ability to route a cable through the application (e.g., around equipment corners) for greater protection and ease of assembly into the end user application. For off-highway applications, the main cable should be stainless steel, which combines corrosion resistance with strength and minimal stretch even after thousands of cycles. An acetal liner will ensure the cable runs smoothly, while a polypropylene jacket will protect the cable from damage and enable it to turn through a bulkhead or via a curve. To ensure maximum functionality and reliability, care must be taken in selecting a rotary system based on the specific requirements of the application. 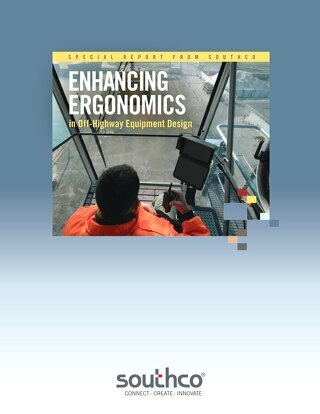 An ergonomic actuator that also performs on a functional level creates a powerful perception of quality and improves user experience. Finally, a high quality cable is vital to connecting the latch and actuator for a complete system. By selecting a complete system of actuator, latch and cable from a recognized supplier, OEMs can be assured that the entire system, as well as the individual components, has undergone extensive testing to meet and even exceed industry standards.